The battle to end bear bile farming struck a major blow by winning hearts and minds in a documentary aired on China’s CCTV10 last week. The one-hour long documentary, made and broadcast by CCTV-10, China’s equivalent of National Geographic or the Discovery Channel, highlighted the work of Animals Asia alongside other organisations and individuals in China trying to protect the country’s bear populations. Aired on the coveted Saturday morning slot via one of the country’s most popular stations, the documentary “Bears and Humans” reached a multi-million audience. 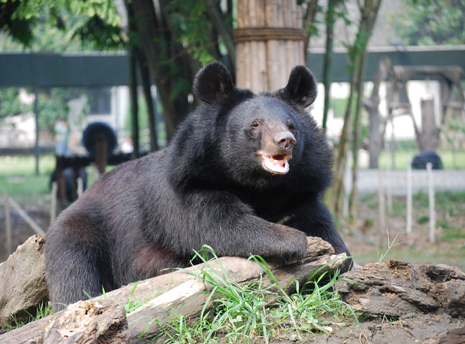 Two of Animals Asia’s bear rescues were highlighted on the programme, the rescue of Tibetan brown bear brother and sister duo Benji and Poupouce in Sichuan province and the extraordinary rescue of black bear cub Jingle who was found stuck up a tree in 2009. 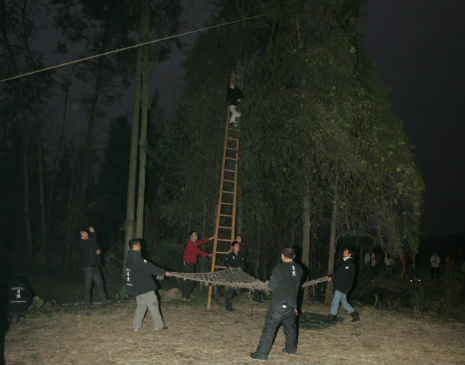 Jingle was discovered 12 metres up a tree in the village of Qinglong, near to Animals Asia’s Chengdu sanctuary – and is believed to have escaped from a bear bile farm. Missing her right front paw from a hunter’s snare, Jingle had become stuck up the tree and a large crowd had formed worried for her welfare. Many of the onlookers brought apples to try to coax Jingle down, but it was only when Animals Asia vets arrived, that Jingle (pictured below this article) was saved. In its praise of those in China devoted to bear protection and rescue, the documentary raised awareness of the plight of China’s many precious bear species and the threat of extinction they face.